The Mongols arose from obscure origins in the recesses of Inner Asia to unify their immediate nomadic neighbors and then to conquer much of the Eurasian landmass, ruling large parts of it for more than a century. Emerging from a newly consolidated heartland north of the Gobi in the thirteenth century, the Mongols and their armies -- made up of conquered peoples -- thrust through western Asia, crossed the Urals, invaded the countries of Eastern Europe, and pressed on to Austria and the Adriatic. They also advanced through southwest Asia to the eastern Mediterranean and conquered the Chinese empire. Around the same time, they embarked on ambitious maritime expeditions against Java and Japan. The Mongols were phenomenally hard driving and ambitious for such a small group, and their accomplishments were considerable. Only the Mamluks of Egypt, the "divine winds" of Japan, and the Mongols' own legal tradition--the need to elect a new khan--halted the inexorable Mongol advances. From the earliest times the tribes that became known as Mongols about the twelfth century dwelt in Eastern Asia, in and about the modern Mongolia. 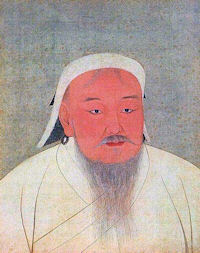 They were organized and made a great conquering power by Genghis Khan. The great Asiatic empire which was made his by conquest was divided among his sons, of whom Ogotai received Northern China and Mongolia and succeeded his father as Great Khan. Under Kublai Khan, the grandson of Genghis, who became Great Khan in 1259, the empire was practically divided into four parts. The first, actually ruled by the Great Khan, included China. Korea. Mongolia. Manchuria, and Tibet, with its capital at Peking. The second, the Middle Tatar Empire, given by Genghis to his son Tchagatai. included Sungaria, Transoxiana, Afghanistan, and a part of Chinese Turkestan. Its history differs in no way from that of other Asiatic States until, under a weak descendant of Tchagatai. the real power fell into the hands of the ruthless Tamerlane or Tinnir who made Samarkand the capital of his empire. The third division of the empire of Genghis Khan, the Empire of Kiptchak, or the Golden Horde, was assigned to Batu, a grandson of Genghis by his eldest son Jujy. In 1237 a vast Mongol horde entered Russia, and after carrying destruction through that country with lire and sword and forcing the princes to do homage, pressed into Poland and Germany, and on the field known as the Mahlstatt, near Liegnitz, in Silesia, defeated an army of Poles. Silesians, and Teutonic Knights in April, 1241, suffering such heavy losses, however, as to be compelled to retreat. In the same year another army under Batu Khan overwhelmed the Hungarians under their King, Bêla IV. In 1242 Batu Khan was recalled to Asia by the news of the death of Ogotai. As long as the House of Batu continued the Kiptchak Mongols or Tatars held Russia in vassalage, and kept Eastern Europe in constant terror. They met their first defeat at the hands of the Russians in 1380; but their strength was most seriously undermined by the new Tatar invasion under Timur (q.v.) in 1389. The empire dissolved into the separate khanates of Kazan, Astrakhan, and the Crimea. In 1480 the Russians emancipated themselves from the overlordship of the Mongols. The khans of the Crimea became vassals of the Turkish sultans in 1475. Kazan was conquered by Ivan the Terrible of Russia in 1552, and Astrakhan in 1554. Resistance to and accommodation of the Mongols had mixed effects on the national developments of some of the "host" nations. European kingdoms and principalities formed alliances to do battle, albeit unsuccessfully, against the Mongol armies. Europeans even combined with the hated Muslims in Egypt and Palestine to oppose the common Mongol enemy. Although the Mongol invasion of Japan was not successful, it contributed to the eventual downfall of Japan's ruling faction. The conquering Mongols brought an infusion of new ideas and unity to China but were eventually absorbed and lost their ability to rule over a people hundreds of times more numerous than themselves. Their presence was institutionalized in many of the lands they conquered through adoption of Mongol military tactics, administrative forms, and commercial enterprises. The historical developments of such disparate nations as Russia, China, and Iran were directly affected by the Mongols. Wherever they settled outside their homeland, the Mongols brought about cultural change and institutional improvements. Although there never was a "Pax Mongolica," the spread of the Mongol polity across Eurasia resulted in a large measure of cultural exchange. Chinese scribes and artists served the court of the Ilkhans in Iran, Italian merchants served the great khans in Karakorum and Daidu (as Beijing was then known), papal envoys recorded events in the courts of the great khans, Mongol princes were dispatched to all points of the great Mongol empire to observe and be observed, and the Golden Horde and their Tatar descendants left a lasting mark on Moscovy through administrative developments and intermarriage. Although eventually subsumed as part of the Chinese empire, the Mongols were quick to seek independence when that empire disintegrated in 1911. China owed to them the precious advantage of entering into communication with occidental civilisations and of participating for a century (1260-1368) in the vast movement of exchange which they promoted over the whole civilised world. In China, as everywhere else where they established themselves, the Mongols caused a moral revolution by bringing into relations with one another peoples which had till then been strangers.